This article is about Ravi and Vishaal’s venture. Their mission, their vision, was to create a business to help people find what they need and feel good about their purchases. Isn’t it awful when you feel that you have to buy something that doesn’t align with your ethics because the alternatives that are available, don’t meet your needs! Find out more about Vyom London, which they created to ensure that those who don’t want to wear non-vegan shoes have access to shoes that are made well, that are available in a range of styles and that they’re made with good quality materials. beanuts is a pop up on Brick Lane. It was meant to be at this location until the end of January but this has been extended until the end of February. Find out why I think you should try and eat there asap. Find out how Veganish made it possible for me to support a small business, try new vegan treats and buy gorgeous gifts for friends and family. Find out why my eyes couldn't cope when I went to the Dough Society! Dough Society went from having a market stall to opening their own donut shop within two years! Find out why it was worth the trip, even though I got to their shop after a lot of their range had sold out! 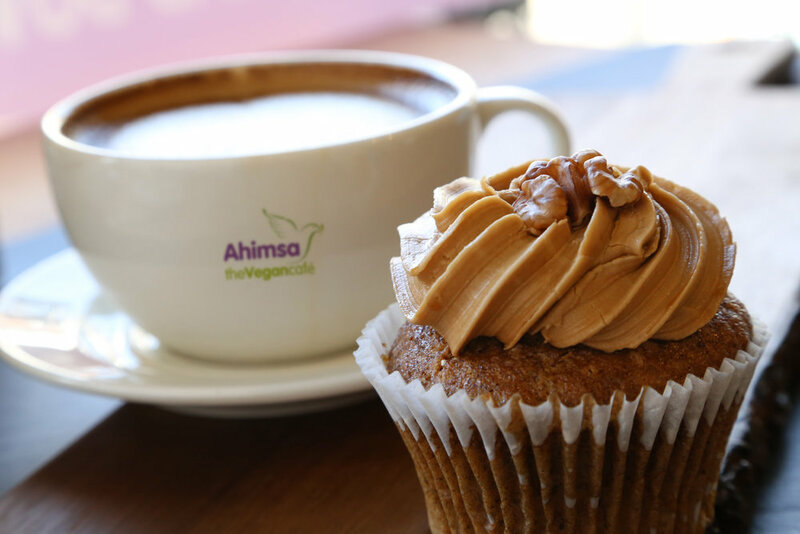 Enjoy this interview style article, through which one of the owners will you tell you everything you need to know, and more; about Ahimsa Vegan Cafe. I met Harrison Huxster at VegFest and loved that his aim was to use his merchandise to influence others through thought provoking messages. Here's some information about his company, Vegan Deviant. If you're nutty about nuts, you'll love Nutural World! The words, 'artisan', 'award winning spreads and butters' and 'without added extras' should give you a taster of what this article has to offer. I met Bassam Sharaf a few months ago. He had a stall where people were queuing up to try his foods. They weren't just trying them; but they were lingering, talking about them and then buying them to take home. The Sharaf mixes empower everyone to make Falafel, and other items, with less effort, without sacrificing how it should taste! Check out this interview style article about Sharaf Foods. Within a year of starting up, Solkiki have won awards for their gourmet chocolate bars. What makes their bars so special? I met Iris and Bob at VegFest and absolutely loved the gourmet look of their chocolate bars. Their packaging was attractive because it was simple yet bold. However, beyond all of that, they had a large variety of flavours, and those I tasted were delicious! Keep reading to discover the difference that using fine cacao beans can make! I had the good fortune of meeting Poppy Lettice when I attended a recent VegFest. Poppy is bubbly, passionate, generous and eager to please her vegan (and non-vegan) customers. The items that she had put on her stall for tasting, disappeared quite quickly, and she was given a lot of positive feedback by us tasters too! I knew you'd want to read about the range of goodies she makes and provides, so here's an article that will tell you that and more!